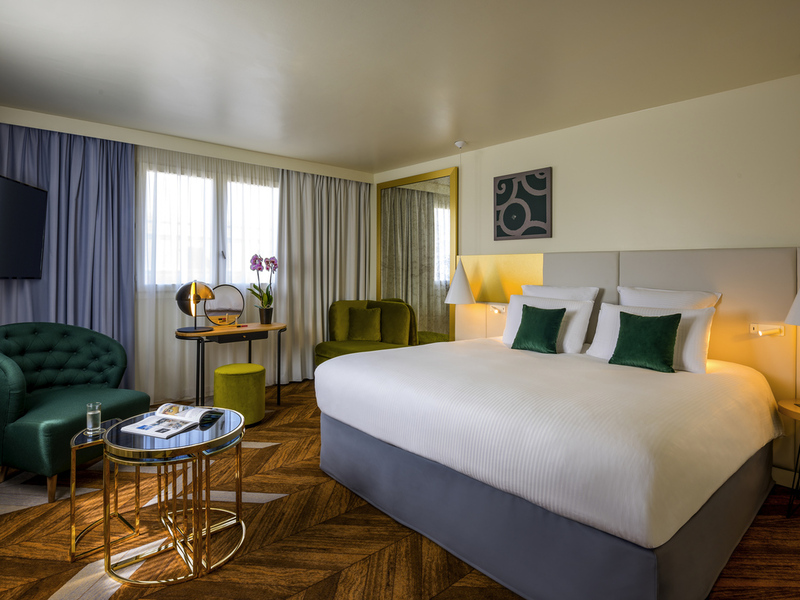 The Le Louis hotel invites you to discover its 4-star facilities in the heart of Versailles, near the Palace of Versailles. 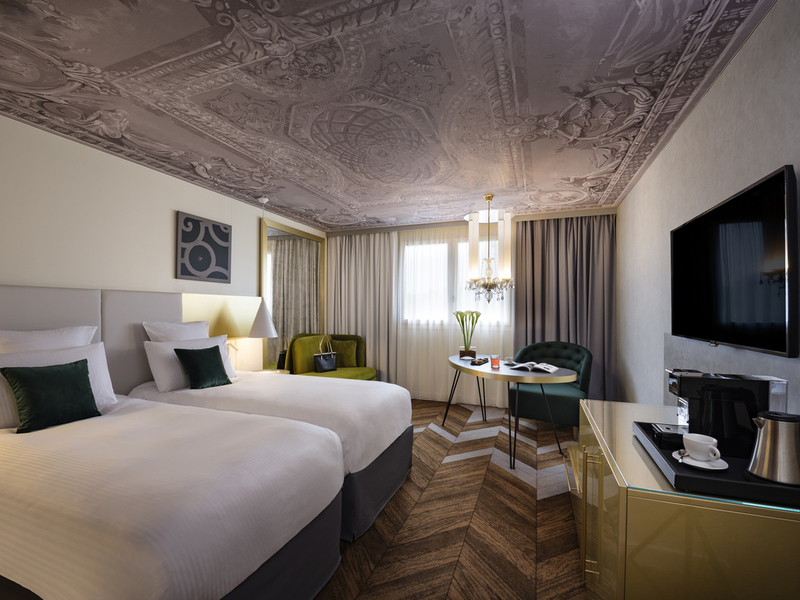 Treat yourself to a luxury stay at a renovated, historic hotel that combines contemporary elegance with classic refinement. Enjoy sunny days on the terrace next to our vegetable garden, or under the glass roof of our bar. The jewel in the bar's crown is its majestic chandelier, because at Le Louis, light is king, giving this luxurious setting its warm and magical aura. Grandeur makes way for an intimate atmosphere in the 152 luxurious rooms and suites at our charming hotel. Modern and individual, these cozy havens include features in the style of the era, such as the herringbone parquet-inspired flooring. Enjoy our wellness area with spa and fitness room before meeting colleagues or clients in one of our eight fully equipped meeting rooms. Whether you're on a luxury vacation or a business trip, our friendly staff are at your service. In the sun and hidden from view, the terrace is ideal for a lunch or private event. 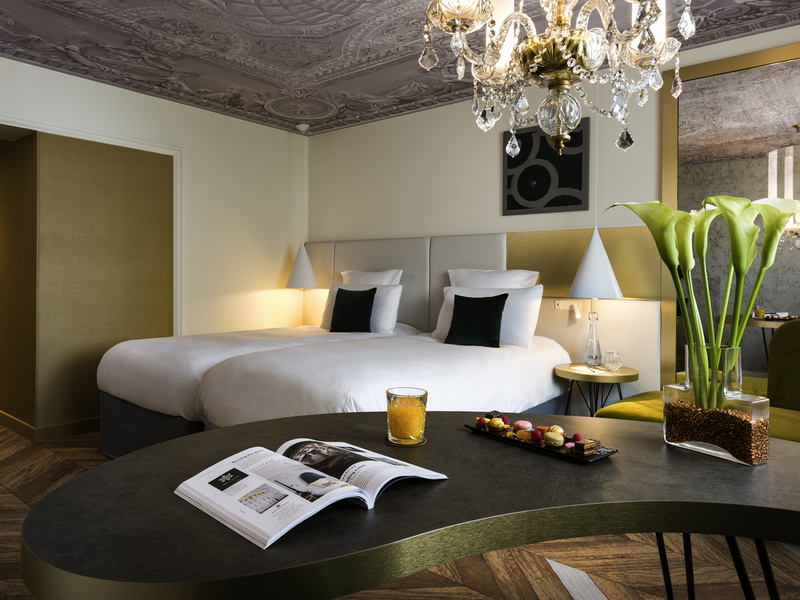 In the heart of Versailles, the Le Louis hotel invites you to admire the splendor of the nearby palace. The centerpiece of the bar, the large chandelier is a contemporary nod to the roofs of the palace. The Le Louis Versailles Château hotel's classic facade overlooks the main avenue leading to the palace. Passing through the archway entrance, listed as a historical monument, you'll be captivated by the grandeur of the reception hall and galleries. 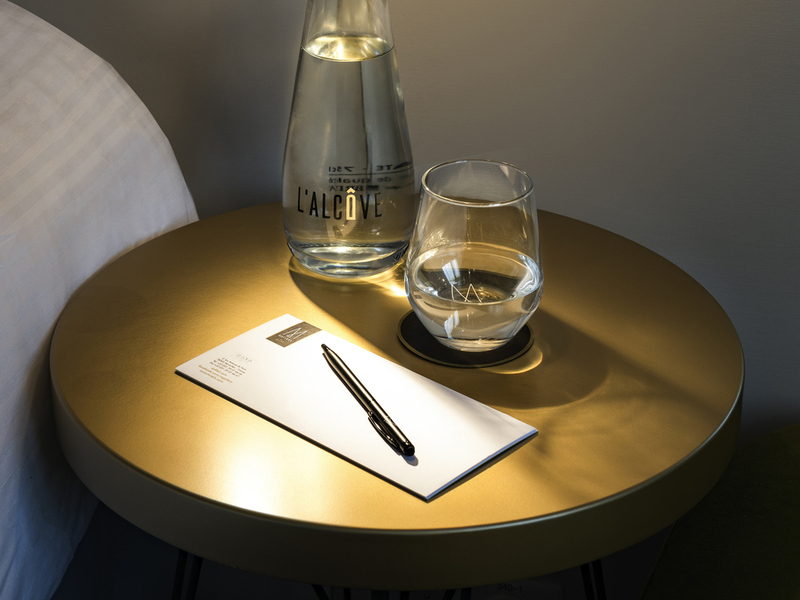 Echoing the harmony so precious to the Sun King, the classic beauty of this 19th century hotel is combined with the contemporary chic of the bar and restaurant. Savor a tea at the window of your special sanctuary under the mansard roof. A chandelier hangs from the trompe-l'oeil ceiling as you read by the light of a lamp inspired by the trees in the royal gardens. A simple name reflects the beauty of the court - Le Louis is a unique combination of glorious history and modern luxury. Immerse yourself in the intimacy of royal life by visiting the splendid private apartments of Louis XIV and of Louis XV and his mistresses. In summer, relive the pastimes of the era's nobility with a themed walk through the gardens. Beyond its famous palace, Versailles is a charming and bustling city whose heritage is a reminder of its important place in France's history. Wander between the center's cafés and antique stores before watching a performance at the Théâtre Montansier. Pullman Versailles Chateau: From Paris, take the A13 highway, then the Versailles Château exit. From Orly, take the N186, then the A86 toward Versailles. From Roissy Charles de Gaulle, take the A1 highway (E15, E19), then the west ring road and then the A13 highway and exit at Versailles Château. 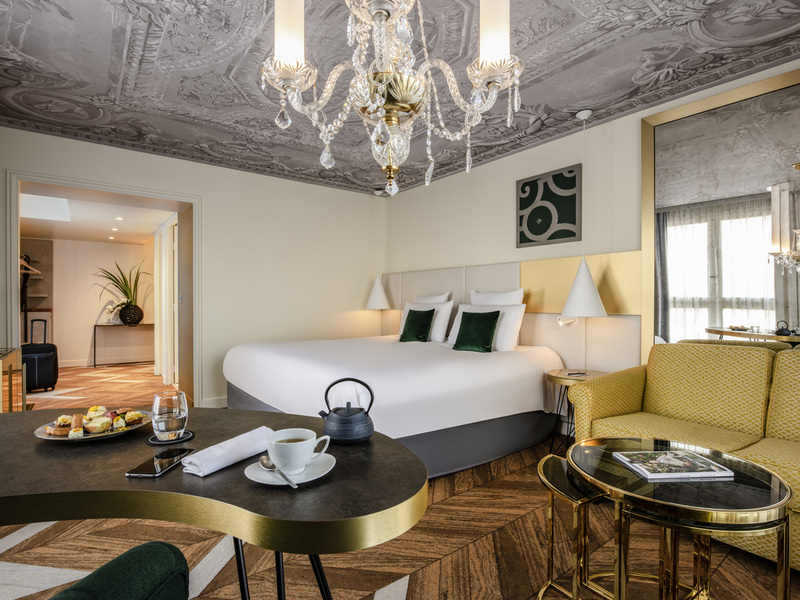 Experience the privilege of a tailor-made service as soon as you arrive by savoring our Dammann Frères welcome tea in the comfort of your cozy room or luxury suite. Throughout your stay, our staff will ensure you can enjoy privacy, peace and serenity. 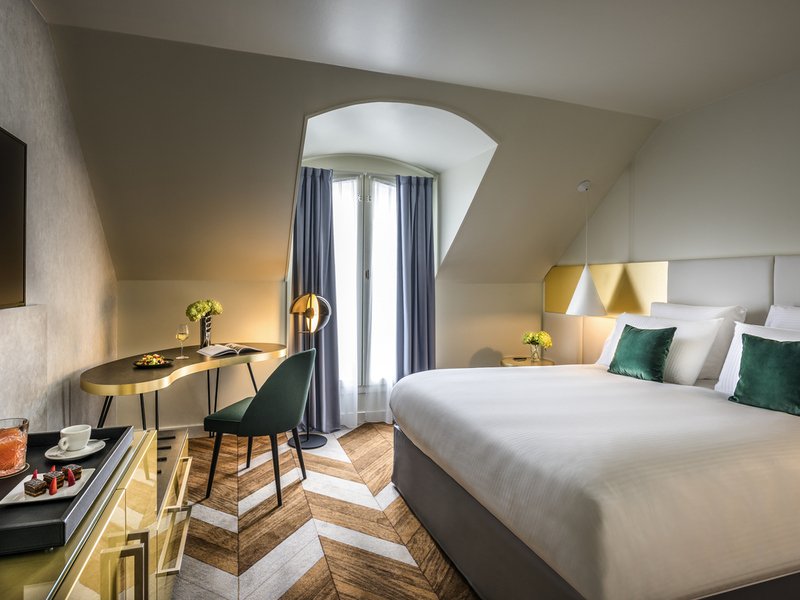 Old meets modern in our mansard rooms where old-fashioned mirrors and conical lamps sit side by side under a classic chandelier. The herringbone parquet-inspired floor gives your timeless paradise a warm ambience. 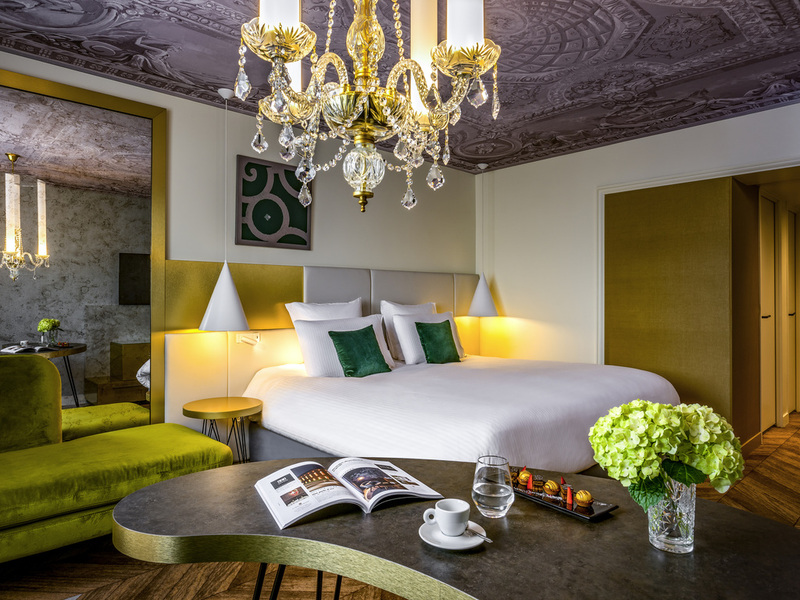 The height of elegance, each suite invites you to delve into the history of a great figure of Versailles through sketches and books: Louis XIV of course, but also Madame Élisabeth, Vauban, Vigée Le Brun and Marie-Antoinette. 23 m² (247 ft²) attic room with balcony and 48" TV, office space, mini-bar, kettle, Dammann tea and Segafredo coffee, bathroom with rainshower tub, Clarins products, bathrobes and slippers. Charming period Suite measuring 398 sq. ft. (37 m²) featuring: two 55" TVs, complimentary minibar, Dammann tea, Illy coffee machine, bathroom with rain shower bathtub, Clarins products, separate toilet, bathrobes and slippers. Elegant and refined Suite measuring 495 sq. ft. (46 m²), composed of 2 rooms featuring: two 55" TVs, complimentary minibar, Dammann tea, Illy coffee machine, bathroom with rain shower bathtub, Clarins products, separate toilet, bathrobes and slippers. Intimate and cozy Suite measuring 667 sq. ft. (62 m²), composed of 2 attic rooms, continuous balcony, featuring: two 55" TVs, complimentary minibar, Dammann tea, Illy coffee machine, bathtub and walk-in rain shower, Clarins products, separate toilet. Discover the flavors of French cuisine with a new twist in the exclusive setting of the Alcôve restaurant. In the style of places featuring treasures from the era, our chef combines the modern with the traditional to create a treat for your taste buds. Enjoy a cocktail or exceptional wine in a spectacular location. Inspired by the roofs of the palace, the chandelier hanging above the bar gives the space unique lighting and atmosphere, like a contemporary version of the classic splendor of Versailles. The bar and restaurant add a contemporary twist to the palace design. In their elegant uniform, our friendly teams combine sophistication with a warm welcome. At the Alcôve, you will savor the look of our fine dishes before even tasting them. Our eight modular meeting and conference rooms can accommodate up to 180 people. In addition to the Orangerie room, our marquis rooms - Montespan, Maintenon and Pompadour - can be combined for larger events. The more intimate Saint-Louis and Notre Dame rooms lend themselves to smaller group meetings. Our manager will help you to organize your project in our renovated rooms, which are equipped with the latest technology to make your meetings a success. I wish you a warm welcome to our hotel, which has been fully renovated to the highest standards. As holders of the Clefs d'Or badge of excellence, my team and I are committed to giving you a relaxing stay full of elegance and excitement. In addition to a hammam, sauna and sensory shower, our wellness area also includes a fitness center. 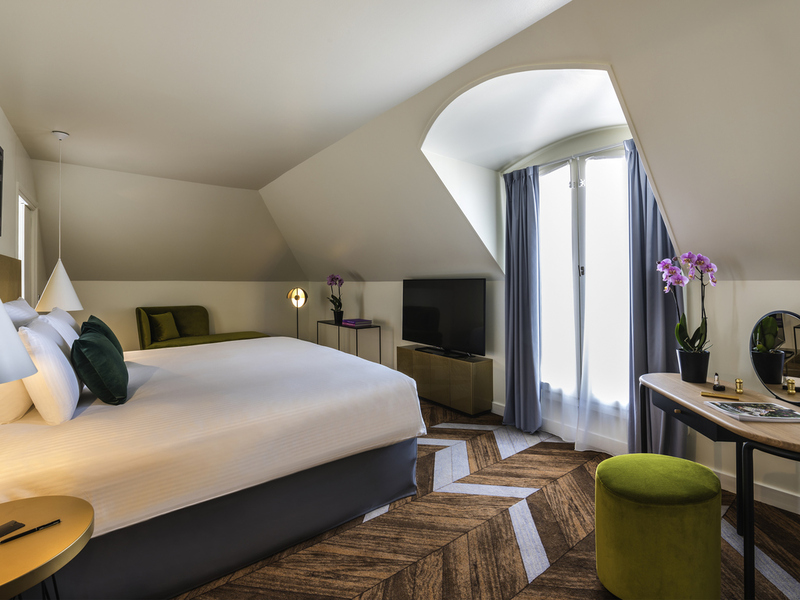 Day or night, escape for a moment of relaxation under the hotel's mansard roof.